IMAGINE there was a disaster where 8.4 million people – the entire population of London – couldn’t get enough decent, nutritious food to eat every day. Then imagine that every year enough good food to provide 650 million meals for these people – that’s 77 meals each – is being chucked away in landfill, or sent to be turned into fuel, or fed to animals. And then imagine the impact all this chucking away is having on the environment. The biggest disaster of all is that none of this has to be imagined. Because it’s actually happening right now. 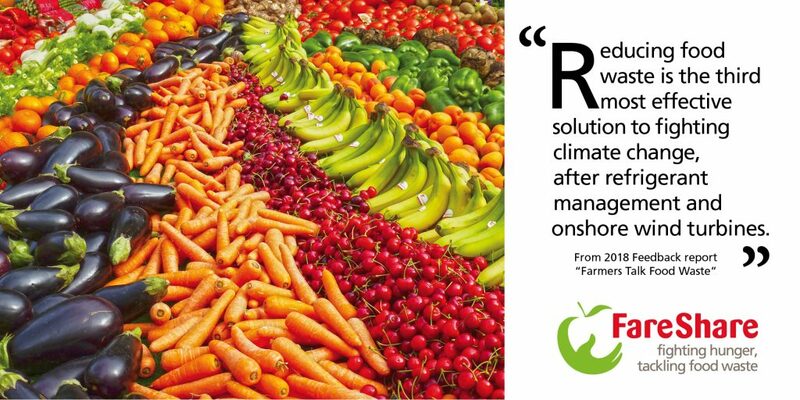 Every year 1.9 million tonnes of surplus food is wasted by the UK food industry. The human tragedy is terrible enough. But it’s no less a disaster for the environment, says FareShare, the UK’s largest charity dedicated to redistributing this surplus food to charities and organisations to help feed people in need. Lindsay is keen to emphasise that the food FareShare redistributes is not waste food, like the gone-off banana lurking at the back of your fridge. It’s a staggering range of quality, edible food – like beef, chicken, fruit, vegetables, tinned food, and so on – food that has become surplus for simple reasons such as over-production, labelling errors or short shelf-life. Surplus food occurs everywhere in the supply chain, from field through to fork, says Lindsay. And when it comes to getting rid of this completely edible surplus, not much makes its way to charities like FareShare. All but 5 per cent is sold for animal feed, used for bio energy or simply chucked away. The environmental importance of FareShare’s mission – to redistribute good quality surplus food to those who need it – can be seen in the choice of partner to run its Manchester warehouse. Emerge is actually a recycling charity. And while feeding people who need it is vital, reducing the environmental impact of all this surplus food is increasingly important, too. Well, the Waste and Resources Action Programme (WRAP) estimates that UK food waste is associated with greenhouse gas emissions of over 20 million tonnes. And that’s not including all the water, fuels and associated environmental costs of producing and distributing it. 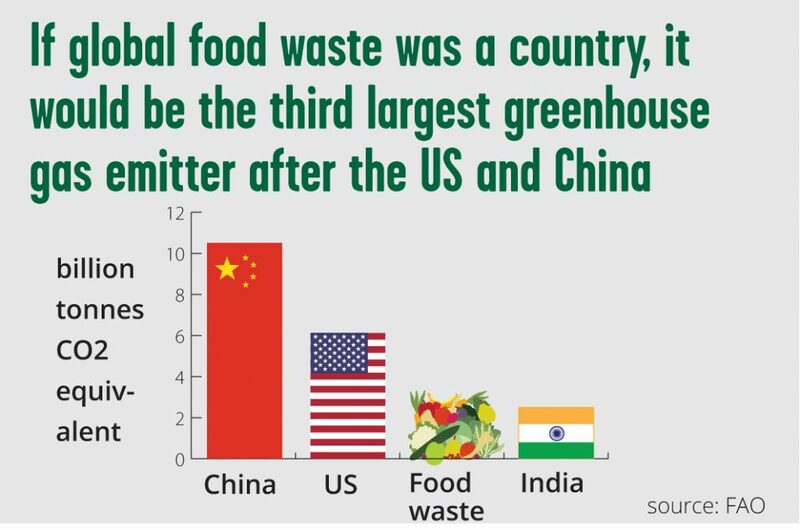 According to the global research organisation the World Resources Institute, if food waste were a country it would be the third biggest emitter of greenhouse gases after the USA and China. 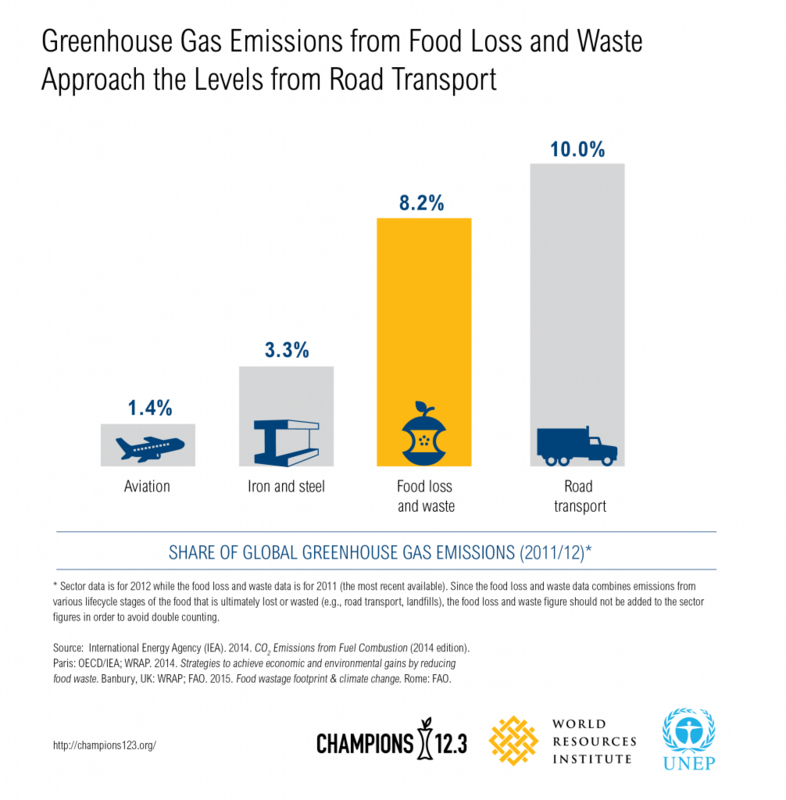 The Institute says that globally, food loss and waste generates more than four times as much annual greenhouse gas emissions as aviation and is comparable to emissions from road transport. These food industry emissions come from a variety of sources including on-farm —from the digestive systems of cows, manure from livestock, on-farm energy use and fertilizer, for producing food that is ultimately lost or wasted. They also come from the production of heat and energy used to manufacture the food that is lost or wasted, the heating for strawberries or salads, for example. Then there’s the energy used to transport, store and cook this lost food, the emissions from landfill when it all decays. And, finally, the emissions caused by land-use change when we plough up a meadow or hack down a forest to produce farmland for meat or veg that no human will ever eat. It’s a grim environmental picture but, says FareShare’s Lindsay Boswell, one that doesn’t have to be this way. While the idea of people going hungry is easy to understand and respond to, according to Lindsay; ‘Everyone hates waste’, the harm to the environment is rarely considered. Indeed, there are relatively few statistics and reports on the issue because, globally, it’s been so hard to quantify. One organisation that has investigated is the United Nations’ Food and Agriculture Organisation whose Think Eat Save initiative is a global effort to cut down on food loss and waste. Fifty four percent of the world’s food wastage occurs ‘upstream’ during production, post-harvest handling and storage, according to an FAO’s study. Forty six percent of it happens ‘downstream,’ at the processing, distribution and consumption stages. And, putting that into a context we can all understand UNESCO, the United Nations Scientific and Cultural Organisation, explained it like this in 2010. “It takes over 15,000 litres of water to produce an average kilo of beef. This compares with around 1,200 litres for a kg of maize and 1,800 for a kilo of wheat,” it said. That means that for every kilo of beef – say mince or hamburger – that doesn’t get redistributed by FareShare, 15,000 litres of water has potentially been wasted. Not to mention the feed, transportation costs of the cattle and everything else that goes into food production. The anti food waste organisation OLIO claims it takes a land mass ‘larger than China’ to grow the food each year that is ultimately never eaten. “Land that has been deforested, species that have been driven to extinction, indigenous populations that have been moved, soil that has been degraded – all to produce food that we then just throw away,” it said. For these reasons – and all the ones above – FareShare wants to increase the amount of surplus food it redistributes.